Bangladeshi garments industry has a famous reputation in the worlds competitive garments market. Bangladesh is far ahead than other garments manufacturing countries due to its ability to produce high quality product with low price than other garments manufacturing countries. As result new importers are willingly coming into our country to place their orders, where most of them are coming through garments buying houses as they have no enough idea to place order and execution here. As a result, buying house plays an important role in Bangladeshi Ready-made garments manufacturing sector. Some top Bangladeshi garment manufacturer’s name and their details have presented in this article. Jashimuddin Avenue, Uttara, Dhaka-1230, Bangladesh. Road#16 (Old 27), Dhanmondi R/A, Dhaka-1209, Bangladesh. 13. Givensee Group of Industries Ltd.
Uttara Model Town, Uttara, Dhaka, Bangladesh. 15. SAG Fashion International Ltd.
17. GG Fashion House Ltd.
19. Fashion Plus International Ltd.
21. Oriental Fashion BD Ltd.
Tongi Industrial Area, Tongi, Gazipur, Bangladesh. 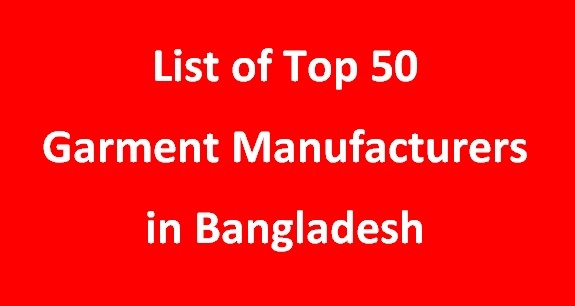 Above list is only for Bangladeshi garment manufacturers. If your garment manufacturing company missed out and you think that your company can take place in top 50 lists then please pass your comment at comment box. Your all comments are warmly received here. If you have any doubt about the above ranking then we will review your comment. If possible then we will also add your nominated clothing manufacturing company in top 50 lists. Thanks for your nice comment……. Thanks at first. Here should have mentioned the contact person designation!!!!! Ok…will do it very soon. thanks for wonder sharing. hope that will be work for all. find this awesome site from zugtech. 🙂 thanks for sharing this awesome things. need fresh orders for summer 2017.knit composite garments with vertical set up. Update information send to me by email. I need buying house only. We manufacture & supply garments accessories. If any body need accessories pls call us. Hi…i am sohel.doing job as a marketing executive of fabric suppliers company.Company name is ONIN TEXTILES our office in Mohakhali DOHS at Road 24.house 340.we are manufacturing all kinds of pocketing and shelf fabric.if any body need any woven fabric please contact with me…. i am anwar shahadat do i job now buying house . my need new job buying house . Im Clearing and forwading Agent…. I Am Md Mohasin Alam Mollah.I Have Need a job Any Buying House.Please Contac 0177 0000 147. This is Sajib from APS Group now I am working here as a Merchandiser. Now I am looking new job in Buying House, I have 6 years more real experience in Knit Division. if anybody want please inform me. Thanks! This is Rifath Ahmed from Nazmul Hosiery Pvt.Ltd now I am working here as a Merchandiser. Thank you very much for informative writing . We all appreciate you to write more about garments merchandising . sir its good for us..
bcz new genaration will learn them.. This is a great initiatives taken by your self. Thank You. My opinion that you will mention only Buying house name in your list. As there are so many manufacturer name listed in your list and you may avoid that. Also you may add our company in your list as Corolla Fashion started as Buying House since 20 years. Great list. Searching it for a long time.